Good grief, those look so fine they oughta be against the law! Too purdy to get dirty! 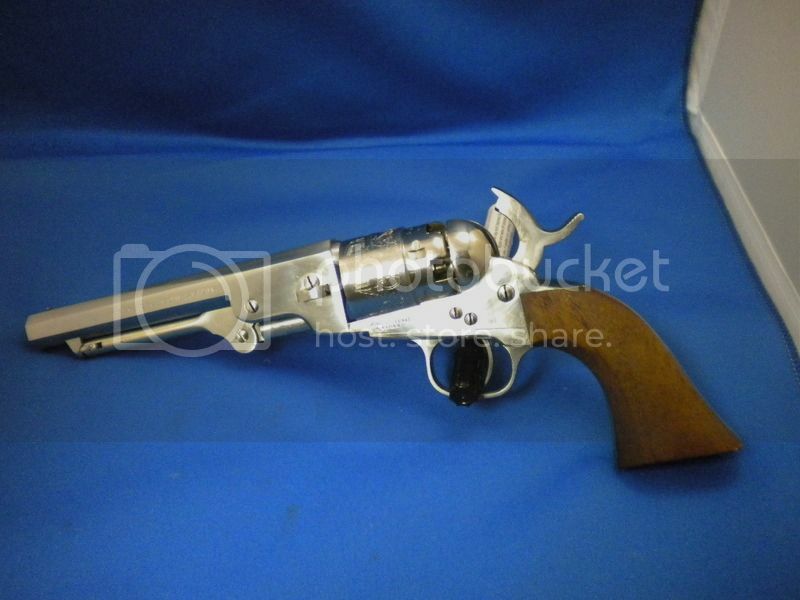 In the early to mid 1980s, Uberti produced a line of stainless steel percussion Colt revolvers that were imported to the US by Allen Firearms, Santa Fe, NM; Southwest Muzzleloaders Supply, Inc. Angleton, TX, Uberti USA, and possibly others. They are now also known to have been sold in Europe under the HEGE dealer name. The current total of known revolvers is thirty five. 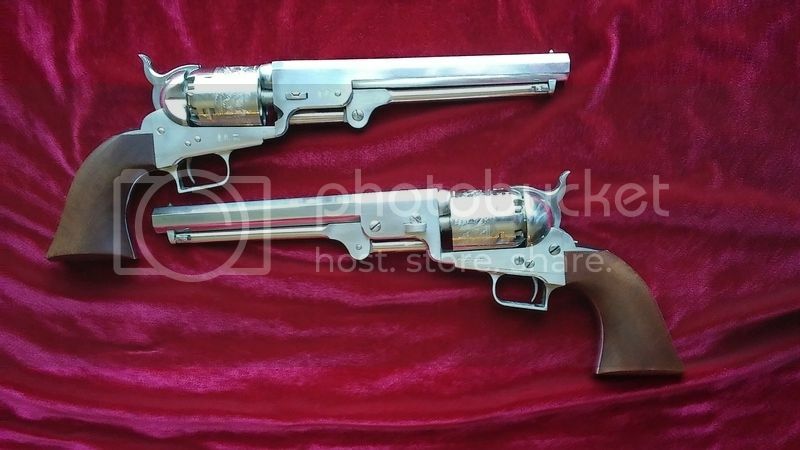 I have nine of these revolvers and know of twenty six in the hands of other collectors or BP shooters. 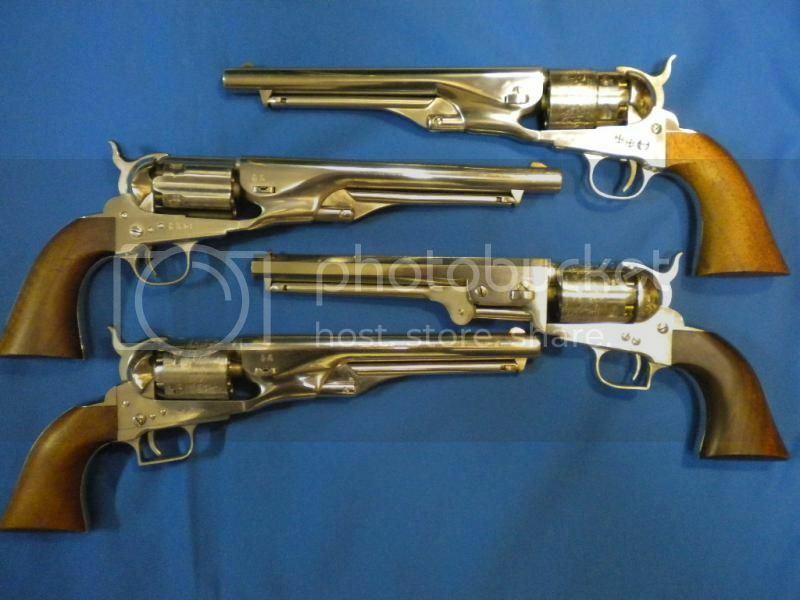 Two of the known revolvers are in Switzerland, one is in England, one in Spain, one in Poland and an 1861 Navy sold on GunBroker earlier this month (Feb ‘19). The Swiss and Polish models are marked Original Hege on the barrel, the English model has the typical Allen Firearms barrel address, and the one in Spain has a blank barrel. Markings for the one sold earlier this month is unknown. Seller wouldn't respond to inquiries. Anyone with information concerning Allen Firearms, Southwest Muzzleloaders Supply or any other Uberti Stainless Steel Colt style revolvers is requested to contact fingersmcgee@charter.net I am seeking information as to models, manufacture dates, serial numbers, barrel markings, barrel lengths, trigger guards, and any other characteristics as well as catalog, brochure, and original packaging information. Of course, if anyone has any for sale, I would be interested in that also.